Despite an extensive literature examining the optimal financing mix, little work exists on firms’ preferences over specific debt financing characteristics. This column uses experimental data from Europe to analyse the link between different external financing characteristics and investment decisions. The findings suggest that modest improvements in financing terms can more than double the probability of investment. Investment decisions are particularly sensitive to interest rates and collateral requirements. The question of how firms finance their business and investment activity is long-standing in the academic literature as well as in policy circles. Indeed, the availability of sufficient sources of funding is at the heart of the dynamics and functioning of market economies. The stabilising role of monetary policy relies on the transmission of lower costs of external funding into higher demand through increased consumption and/or investment activity. The leading theories on the optimal financing mix – Modigliani and Miller's (1958)capital-structure irrelevance, the trade-off theory (Kraus and Litzenberger 1973), agency theories (Jensen and Meckling 1976) and the pecking-order theory (Myers and Majluf 1984) – and the overwhelming majority of empirical analyses attempt to explain the proportions of debt and equity instruments in a firm’s total liabilities (Myers 2001). To the best of our knowledge, however, almost no theoretical or empirical work exists that analyses preferences of firms over specific characteristics of debt financing, such as collateral requirements, maturity or fixed versus floating interest rates and their pass-through to real investment decisions, and how these translate into real activity. 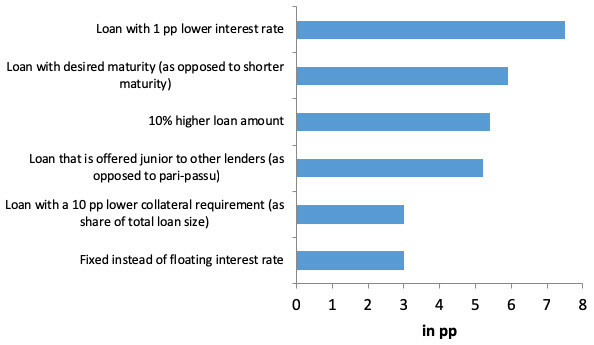 Understanding how specific firms value different financing options, and how loan characteristics relate to their investment decisions is of crucial relevance for economic modelling, the design of loan offers by private and promotional banks (such as the EIB), and for central banks in evaluating the functioning of monetary policy through interest rates (especially at the zero lower bound). Indeed, in the current, low interest rate environment, a policy that extends financing maturities might almost be as effective in stimulating investment as a policy that aims to lower interest rates even further. In a recent paper, we address this gap in the literature (Brutscheret al. 2017). We exploit data from a unique experiment conducted among European firms with an investment project as part of the first wave of the EIB Investment Survey in 2016, and analyse which loan characteristics are the drivers of companies’ investment decisions. Our final sample contains a total of 1,126 firms (of which around 80% are SMEs). About one third of firms are active in manufacturing, another third in the infrastructure sector, and the rest are more or less evenly split between the service and construction sectors. As part of the experiment, each firm was first asked whether it was currently considering putting into place a specific investment project, and, if so, what type of project this would be, the size of the project, and how much external financing they would like to raise for the project with what ideal maturity. In a second step, firms were asked to choose between pairs of randomly drawn hypothetical financing offers. Financing offers differed in terms of their amount and maturity (distributed around firms’ preferred amount and maturity), amortisation, interest rate (distributed around a market mid-rate according to the ECB), interest type, level of seniority, collateral requirements, and whether or not there is a fee for early repayment. Firms could thus choose between more or less favourable offers. 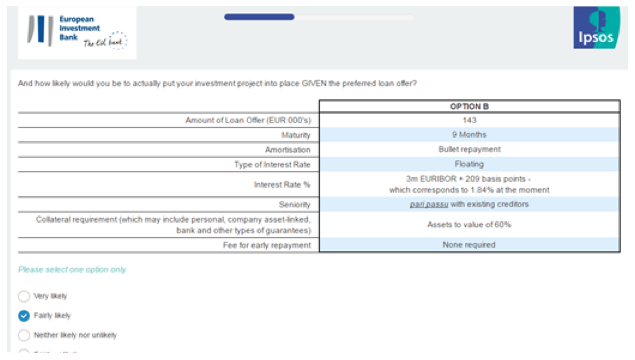 Finally, firms were required to state how likely they would be to put into place their favourite investment project, given the financing offer that they had chosen in the second step. All firms were shown eight screens like the one in Figure 1. Note: Offers’ characteristics are randomly drawn. The experiment allows us to illustrate how much the probability to invest increases or decreases if financing terms change. one that is slightly better than the conservative, insofar as it aligns the loan offer with the desired amount and maturity, provides a lower interest rate than the market for fixed rates, and comes with more favourable collateral requirements. What the table shows is that the difference in implementation probability between the two cases is substantial – while under the ‘conservative offer’ only one in two firms say that they would go ahead with the investment project, under the ‘improved offers’ it is four out of five firms. Note: The example chosen is a manufacturing company in France wishing to borrow €5 million at 10 years. The loan characteristics with the highest effect on firms’ willingness to implement an investment project are the interest rate, the loan amount, and collateral requirements. A reduction of collateral requirements from 100% to 50%, for example, is associated with a 15 percentage point increase in the probability that a company goes ahead with a project. The relationship between the different financing characteristics and firms’ willingness to invest vary, however, across firm types and investment projects – while large firms’ implementation probabilities are particularly sensitive to interest rates, smaller firms (and highly levered firms) are more sensitive to the seniority level of the financing offered. Similarly, while service sector firms and firms investing heavily in intangibles care a lot about the loan amount, manufacturing firms are more concerned about having their interest rates fixed. In this note, we have summarised a unique experiment conducted as part of the EIB Investment Survey, which helps us better understand the link between financing characteristics and investment project implementation probabilities. The quantification of the effect of different loan characteristics on project implementation provides an important benchmark on how far specific terms of external finance can go in fostering investment activities given real conditions. Specifically, it captures in a clean way the elasticity of project implementation with respect to the interest rate – a key variable in the transmission of monetary policy – as well as other loan characteristics (e.g. collateral, maturity, etc). Our findings shed light on the role of finance when it comes to stimulating investment projects and provides new insights on how to tailor policy measures aimed at firms’ access to finance – including the products offered by the EIB – to maximise their impact in terms of project implementation probabilities. Brutscher, P-B, J Heipertz, and C Hols (2017), “Loan characteristics, firm preferences and investment: Evidence from a unique experiment”, EIB, Working Papers 3. Jensen, M C and W H Meckling (1976), “Theory of the firm: Managerial behavior, agency costs and ownership structure”, Journal of Financial Economics 3(4): 305–60. Kraus, A and R H Litzenberger (1973), “A state-preference model of optimal financial leverage”, Journal of Finance 28(4): 911–22. Modigliani, F and M H Miller (1958), “The cost of capital, corporation finance and the theory of investment”, American Economic Review 48(3): 261–97. Myers, S C (2001), “Capital structure”, Journal of Economic Perspectives 15(2): 81–102. Myers, S C and N S Majluf (1984), “Corporate financing and investment decisions when firms have information that investors do not have”, Journal of Financial Economics 13(2): 187–221.